With terrific waveshaping and a monster mod matrix, this hybrid subtractive synth is an impressive debut for Reveal Sound. Flexible oscillators. Accessible design. Self-resonating filters. Nicely outfitted LFOs. Superb modulation matrix. Touchy menus. Envelope shapes not shown in displays. Listening to the demos and perusing the presets and parameters, you might be inclined to classify Reveal Sound's new cross-platform VST/AU synthesiser as yet another trance 'n' dance machine. And it may indeed be geared up for just that, with its fat unison oscillators and big, brash, bombastic tones. 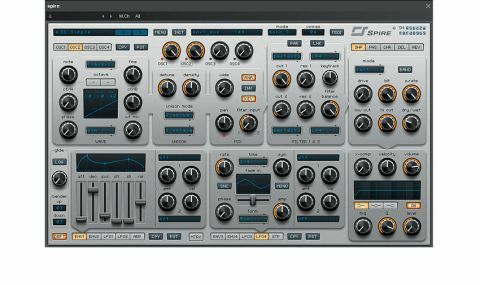 "Clever and unusual features give Spire the ability to do things you wouldn't expect from a typical virtual analogue synth"
Yet it only takes a little digging to unearth some clever and unusual features that give Spire the ability to do things you wouldn't expect from a typical virtual analogue synth. We say "analogue" and, yes, Spire has all of the usual analogue fittings; however, it might be better to think of it simply as a subtractive synth in the truest sense of the term, by which we mean it starts with a complex waveform and filters frequencies out of it. However, the available waveforms go far beyond the usual allotment of sine, saw, square and triangle shapes that we usually associate with virtual analogue synths. Spire's architecture may be based on familiar subtractive concepts, with filters, envelopes, LFOs and a mod matrix all present, but each of those sections offers a little something extra. Starting with the oscillator section, you get four to play with, and they go some way beyond the conventional. The sound of each oscillator is determined by a pair of drop-down menus: one for choosing the synthesis Mode, the other for selecting the sample-based waveform to be mixed with it. The former provides Classic, Noise, FM and AMSync options, each based on a particular type of sound: Classic, Noise, and FM are as you'd expect, and AMSync provides a nasal-sounding modulated wave based on oscillator sync and amplitude modulation. The selected wave can then be modulated to varying degrees using the ctrlA and ctrlB knobs, which alter the waveforms in various ways, depending on the Mode selected. "Spire can produce a vast number of tones depending on the wave and synthesis Mode you're using"
For example, in Classic Mode, turning ctrlA fully clockwise produces a square wave. With the Noise Mode selected, ctrlA acts as a filter cutoff control and ctrlB adjusts resonance. When using FM Mode, the ctrl knobs alter pitch and mod frequency. Note and Fine knobs set the pitch, and you can adjust the phase as well. Things get really interesting when you get to the Wave menu. Here you can choose from 49 waveforms, including all the usual analogue suspects, plus various vocal, violin, piano, organ, synthetic and other unusual types. Spire can produce a vast number of tones depending on the wave and synthesis Mode you're using, as well as the various knob settings. The developer calls this hybrid wavetable/waveshaping technique "polymorphing". Call it what you like, it's powerful and flexible, and it gives Spire potential longevity. Oh, and a nice touch: you can copy and paste your settings between the four oscillators. "Spire additionally offers a range of musical intervals (eg, fifths, octaves, etc) by which to offset the oscillators"
The oscillators each have a Unison section that allows up to nine sets of them to be stacked and detuned against one another in the usual way. Interestingly though, Spire additionally offers a range of musical intervals (eg, fifths, octaves, etc) by which to offset the oscillators. The dual resonant filter section is likewise over-endowed. The filters can be run in series or parallel, and their various modes and slopes are spread across three types: Acido, Perfecto and Infecto. Perfecto is a classic 4-pole type with low-pass, high-pass, band-pass and peak modes; Infecto offers 2-pole low-pass, high-pass, band- pass and notch modes; and Acido offers a quartet of low-pass modes. The Perfecto filter self-oscillates, as it should. Spire offers four envelopes and four LFOs. The envelopes are six-stagers with selectable curves for each segment. Oddly, though, the display only indicates the curve types, not the actual envelope shape, making it confusing at best and useless at worst - just the display, that is, not the envelopes themselves. The syncable LFOs feature five different waveforms, including two flavours of sample and hold. As with the oscillators, you can adjust their phase. You can also shift the symmetry up and down, while a slider changes the waveshape, morphing from triangle through sine to square. Again, they're just slightly more flexible than what you'd find on the average VA or hybrid synth. Two of the more enticing mod sources are the currently-absent step modulator and arpeggiator. Clicking over to them at the moment results in a frustrating, if enticing, "Coming Soon" banner. These are due to be added at some point in the near future, and early adopters will of course get them in a free update. Finally, a decent complement of effects are onboard - delay, reverb, waveshaping, phaser and chorus - and an EQ rounds out the signal. Reveal Sound has a winner on its hands with Spire - it's clearly not afraid to leave the comfort zone of simulated voltage and enter brazenly digital territory. The synth does have some quirks, though. Some of the menus can be difficult to open, requiring a couple of clicks in just the right place, and the envelope displays are a waste in their current form. Ultimately, however, Spire sounds terrific, generating everything from huge, brassy unison timbres to crystalline digital tones. Towering.